Erm excuse me. Where the hell has 2016 gone? I’m sure it was only yesterday that we were saying goodbye to 2015, I blinked and now we’re sitting here in a Brie and Prosecco induced coma on the brink of 2017!! Part of that is the groundhog day like nature of routines and school with young children. But it would not be an understatement to say that the super sonic pace that things have happened for This Mum Runs in 2016 have some part to play in this too. I am prone to exaggerate, but it’s no exaggeration to say that it has been the most life changing of my *ahem* humble 43 year long life. I can also say hand on heart that it is the year that I am most proud of in my entire working life. Without wanting to sound all Hallmark (“Mummy, are you crying again?”), running with you lot and working with our HQ team, our Run Makers and Run Angels, is the most heartwarming, motivating and just-so-bloody- rewarding thing I have ever been involved with. So it feels important on the eve of a new year to reflect on the amazing things you have all achieved. And it wouldn’t be New Years Eve without another ‘Best Of….’ count down, would it. I’ll keep it to ten highlights, though, as I know all of us have got social lives to go to (haha!). In no particular order as they are all pretty amazing! More than 10,000 posts, nearly 130,000 Likes and 52,000 comments. I know, right! We all clearly need to spend less time on social media. But that aside I think that’s pretty flippin’ special! On the one hand I can’t get my head around the sheer scale of the interaction in our community. On the other I am totally unsurprised by it. The absolute best thing about TMR for me is the support we all give each other. There is never a post that goes unanswered, a challenge that can’t be worked out together or a personal success that is not massively celebrated. You all made this happen, so a collective hug/glass raise/high five to you all for being total superstars. I was reviewing a list of our most popular posts recently and I was delighted to see the post that made the top spot for the entire year. It was posted on November 4th by Anna Randall. Her wonderful Mum, Miriam aged 70, had just completed our new Run20 programme and was pretty chuffed as at times she had thought about giving up. You lot were all pretty impressed too with hundreds of like-ers and comments. And we were chuffed to bits too! For us this is what TMR is all about; making running accessible to ALL women. Yes, running IS for you even if you haven’t ever done it before, even if PE at school was your worst nightmare, even if you are 70 years of age – go Miriam! There are NO barriers here peeps, and we plan to spread this message to the world! The winner of our final award was to me the most important. The winner of our Most inspiring community member only started running in January this year. I first met her at a video shoot where we ran very slowly around a park in the rain and she had only just completed the Couch to 5k. Fast forward to now and she is always running (in literally all weathers), consistently running 3 times a week. She regularly posts about her runs and is brutally honest about the good and the bad. Most of the time she hates it, but recognises this is just part of the joy of running. She epitomises TMR and is an inspiration to everyone. She now attends junior Parkrun with her girls and has even taken them off road running and climbing – things she would never have done prior to running and TMR. I know many of you are inspired by her and you will all be as proud of her as I am. The winner of The Most Inspiring Community Member 2016 was Claire Tiley. At the start of the year we ran from 3 parks. We now offer more courses and runs from an amazing 12 locations and will be adding a couple of additional Bristol locations very soon. We’ve also been inundated with enquiries from hundreds of Mums around the UK keen to launch This Mum Runs groups in their areas which we are super excited about. This will be a big focus for us in 2017. An unbelievable amount of work goes on behind the scenes to make all of these runs possible every week and to make everything run like clockwork. There aren’t many rules, but the three we have are important. If you turn up to one of our runs, I want to know that you feel welcomed, you’re warmed up properly and you don’t get left behind! So I want to take the opportunity to thank EVERYONE involved in making this possible – all of our 100+ Run Angels and our killer team of area coordinators who run their rotas with impressive (scary) organisational skills. You lot are ROCKSTARS and I know how much you are loved by your local running crews. Thank you personally from me and the whole TMR team. I am so proud of the programme of courses that we have developed. Our beginners and improvers programmes have evolved over the past 12 month from talking to our Run Makers throughout courses, through my obsession for feedback and constantly improving what we offer. The Couch to 5k is now Run30 and the 5k Plus now the Run60 and more of you than ever before are signing up for these. 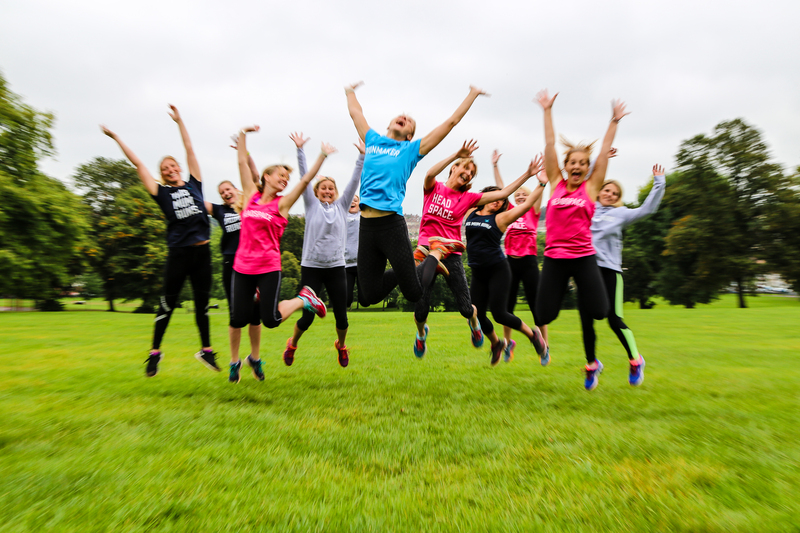 Over 1000 Mums have completed the beginner programme alone and championing non runners is something we are super proud of. Best of all, of all the women who completed our post course survey, 100% of you told us that you would recommend the course to a friend. This is pretty damn incredible (and a prosecco or two has been drunk to celebrate this alone!). It is about having the right programme in part. But it is mainly down to our fabulous team of super dedicated Run Makers -and we have grown the team to 45 this year. They work very hard throughout each course to create a community within their groups, to support and encourage every individual. It is not an understatement to say they care very deeply about all the women they coach and find your achievements very rewarding. There are plans afoot for new programmes in 2017 so watch this space! I’ve always been really open about my dreams of sharing the TMR love far and wide. Sweat, blood and tears alone will get you a long way…but not as far as I hope we can go! So in July this year we launched an equity crowdfunding campaign with the worlds biggest online crowdfunding platform, Crowdcube. Pressing the button to go live was a very scary moment a bit like showing your pants to the world. But I knew that our fab community had my back, and they didn’t let me down. We smashed our target in the first 10 days, going on to reach more than 150% of our original goal. From our 300+ investors, over half of those are TMR runners and an unprecedented 80% of our investors are female. A massive thank you to everyone who supported me personally, to those who championed our campaign amongst their friends and family and of course a special thanks to everyone who invested and officially became part of the TMR journey. Since the summer, we’ve already used some of the investment to launch our online store (see number 9!) and we’ve been busy building a brilliant HQ team. In December Hannah Richardson joined us as Operations Manager, Gemma Davis came on board officially as our Programme Co-ordinator and the awesome Emma Van Heusen as Marketing Manager. We have so many exciting plans for 2017 and cannot wait to share these with you. Patience, patience all will be revealed! 9. Are you being served? I honestly had no idea what was involved in getting an online store successfully off the ground. I mean you just buy some stuff, take a few pics and chuck it on a website, no? Trust me when I say, it is a lot more to it than that and the learning curve was steep. Particularly when you care about great quality and your fab customers as much as we do. So this is a huge highlight for me and a massive thanks to Claire Cox for all her had work on this. Offering a full range of sizes from 6-20. More on this later, but this was not simple and took several months work! Only offering products that we were confident had not been made by kids in sweatshops. You’d imagine this would be a given in this day and age but sadly not. So I am super proud of the WRAP (Worldwide Responsible Accredited Production) status of all our clothing. We launched in late September with 16 products – and several sold out in the first 48 hours! We added some brill gifts in December and a growing range of slogan sweats in time for Christmas. We have excitedly shipped to lovely customers around the UK and as far as Australia and love seeing the pics being shared of people loving their new goodies! Watch this space too peeps, there is lots more planned for 2017. It’s safe to say that despite our lofty ambitions, that we don’t take ourselves too seriously. And so the Weston Christmas Cracker fancy dress 10k is always one of the highlights of our year. 2 years ago, there were only 3 of us from TMR taking part; in 2015 over 100 of us turned up on Weston Beach dressed snowflakes, whipping up a blizzard on the beach. We came 3rd in the fancy dress competition. This year, determined that 1st place would be ours we all spent days (no weeks) battling with glue guns and munching through boxes of Quality Street – only for the sake of the team, obvs. On the day, (in our humble opinions) we were the clear winners. Sadly we were thwarted (robbed)…and had to be content with 2nd place. We spent the first 5k discussing next year’s team costume….Team Pantomime anyone? We even made the local news…. It has been a truly amazing year. On a personal level, having the opportunity to work on something that is your absolute passion is something I pinch myself about daily. Receiving recognition for everything we are achieving as a community through Awards such as Enterprise Nation’s Female Start Up of the Year is just the icing on the very large and creamy cake. Everything that we have been doing (and are planning for 2017) is about one simple dream – to empower more Mums around the world to be happier and healthier. Thank you to everyone who has been with us on the roller coaster of a journey so far and I hope you are as excited as we are about what 2017 may bring. Until then, lets raise (another) glass of bubbly to the fabulous year that was 2016!